This delicious breakfast bowl recipe is packed with healthy protein that will keep you fueled until lunch! It’s the perfect start to any day. 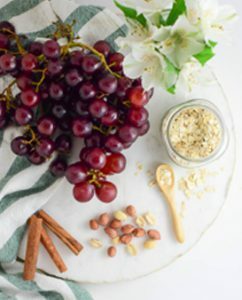 In a mixing bowl, combine oats with milk, yogurt, honey, and cinnamon. Leave in a sealed container overnight. Place 2 cups of whole grapes into a medium sized pot. Heat over medium heat for about 20 minutes, stirring frequently until grapes have burst and juices are reduced by about half. Let grape jelly cool slightly. Can be placed in an air-tight container in fridge for up to a week. 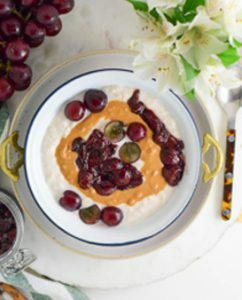 Divide oats into serving bowls and top with peanut butter and grape jelly. Slice remaining grapes in half and place on top of the oats. Eat immediately or refrigerate in sealed container for breakfast for the week.